Gbintri (N/R) Dec. 2, GNA - Vice President Aliu Mahama on Thursday advised the electorate to ask politicians who attempt to buy their votes to rather invest in the money in projects that would permanently address their developmental needs. He said if they accept the money it would only address their short term problems and leave their dire needs unresolved, therefore, they should instead demand the provision of clinics, schools, electricity and other amenities that would improve their general well-being. Vice President Mahama was addressing a durbar held in his honour at Gbintri in the East Mamprusi District as part of his one-week campaign tour of the Northern Region. He advised the electorate to select sensitive, competent and hardworking parliamentarians to improve their standard of living. "Don't look for momentary solutions to your problems, you must sow good seeds so that they would germinate and bear good fruits," he cautioned. "The NPP has capable people to serve you, we have good seeds. We are now reaping the benefits of our seeds as is evidenced by the overwhelming appreciation of good governance that we are receiving from people across the country." The Chief of Gbintri, Na Dana Issil, who described the Vice President's visit as the first from a high ranking dignitary, thanked the government for the development projects in his area and pledged to support it to do more. The Vice President also addressed similar durbars at Samini and Langbinsi, also in the East Mamprusi District and paid courtesy calls on the Nayiri Bohagu Mahamadu Abdulai Sheriga, Paramount Chief of the Mamprugu Traditional Area at Nalerigu and the Poanaba Abiba Sheriga, chief of Samini. At the durbars and palaces, he urged the people to consider politics as mainly a welfare issue, which involves competitors for power to improve the well-being of their people and not to mix up political contests with chieftaincy and religious matters. Mixing politics with religious differences and chieftaincy disputes, he warned, was a recipe for conflicts. The chiefs should also ensure that the peace was maintained in their areas before the elections and afterwards. He introduced the New Patriotic Party's candidate for Nalerigu Constituency, Hajia Alima Mahama, whom he described as a dynamic and sensitive person, and appealed to the people to elect her because she would live up to their expectations. Vice President Mahama also addressed durbars at Nassuan, Yunyoo and Nankpanduri in the Bunkpurugu-Yunyoo District, where Mr Dubik Mahama Yakubu is running on the NPP's ticket in the constituency and canvassed for him. He assured the people that their requests for the provision of police personnel to stem crime in the area; vocational institutions; adequate medical personnel for their clinics and dams to support dry season farming would be addressed when the NPP was returned to power. 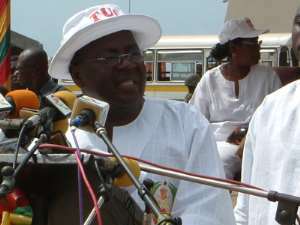 In response to an appeal to the Government to fulfill the 1992 constitutional recommendation that chiefs be paid some allowances, the Vice President said President Kufuor recently tasked the secretariat of the National House of Chiefs to expedite action on the matter and expressed the hope that the issue would soon be addressed. Naba Golbila Kansuk, said President Kufuor had served Ghana well with his visionary and dynamic leadership and, therefore, deserved the support of Ghanaians to enable him to complete his agenda for the nation's advancement. Additionally, Naba Kansuk said, the President had also served the West African Sub-Region creditably as a peace ambassador and distinguished statesman of Africa, saying Ghanaians should endeavour to maintain Ghana's image as a peaceful nation and a beacon of hope for Africa during and after the elections. "Nankpanduri has benefited immensely from President Kufuor's good governance," he remarked. "We have a new district at last following our appeal since 1960, our roads have been paved, we have new schools, street lights and many other good things."